AIR+ from iTOOLS is the world's first disposable dust mask with integrated micro ventilator, which automatically removes exhaled air. Professional tradesmen as well as DIY enthusiasts often work in premises with excess dust particles in the air, and the typical solution is to wear a disposable dust mask. These kinds of masks can quickly become damp on the inside however, and if used for longer periods can become uncomfortable, causing dizziness and headaches, quite simply because much of the exhaled air remains inside the mask. Now, however, the company iTOOLS from Odder, in Denmark, is launching a new disposable dust mask that doesn't just keep the dust out -it automatically removes the exhaled air, so that working with it on becomes much more pleasant. The new dust mask with built-in fresh air is called AIR+ and is the world's first disposable dust mask with an active ventilator. The tiny ventilator weighs just 19 grams and is attached to the mask quickly and simply with just one click. It expels the exhaled air effortlessly, so the air inside the mask is always much cooler and fresher. The measurable effect of the ventilator is that the relative humidity inside the mask is reduced by 40 per cent; the temperature drops by up to 4 degrees Celsius, and it prevents an accumulation of CO2. Three positive results combined provide a dry, cool mask that is comfortable to wear for many hours at a time. 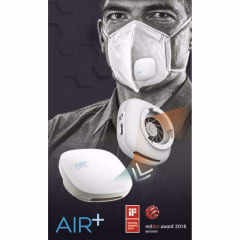 AIR+ consists of two elements: A CE-certified ergonomic, disposable dust mask, which is designed for quick and easy adjustment to any facial shape. Moreover, the tiny rechargeable ventilator can be used countless times and has an operating time per charge of 2 1/2 hours. This combination is a new and innovative solution for improving the working environment, and AIR+ has already won the prestigious international design prizes Red Dot Design Award and iF Design Award. Floor sander Claus Stephansen, from the flooring company Kim Gulvmand in Aarhus, Denmark, has noted that there is also a big financial reward in using the new AIR+ disposable dust masks. So says floor sander Claus Stephansen from the flooring company Kim Gulvmand in Aarhus, Denmark, about his experiences using the AIR+ disposable dust mask from iTOOLS. Claus Stephansen works every day surrounded by dust from sanding down wooden floors and is, therefore, dependent on a dust mask that is both easy to handle and pleasant to wear and is a financially feasible solution. “The ventilator's operating time of 2 1/2 hours is perfectly suited to my needs. I start the day by putting a charged ventilator in my pocket, place a mask in the tool box and put an extra ventilator on charge in the car. And then I'm “up and running” all day long,” finishes Claus Stephansen. Flooring company Kim Gulvmand in Aarhus, Denmark employs 15 floor sanders and carries out all types of flooring jobs for both private customers and companies, and public institutions across Denmark. The company was established in 2004 by Kim Fisker Rasmussen.